We’re now running the 100 Day goal three times a year! Fancy joining us?! It really is the BEST way to make important business-y progress. And it’s super-doable! What is the 100 Day Goal?! The 100 Day Goal is a way of getting a project done. It can be any project but it needs to be something important! It could be something you need to find the time to do (but are wondering how!) or it could be something that, unless you put a bit of oomph behind it, will just drift along. And on that drifting thing – oh sheesh – some of us have whole businesses that are just drifting! Businesses which are doing OK but just going with the flow. Businesses that are not much different to what they were a year ago. Business that are just bobbing along! If that sounds like you, don’t panic, lots of our 100 Day Goal-ers use this process to give their businesses a bit of a kick up the bum! 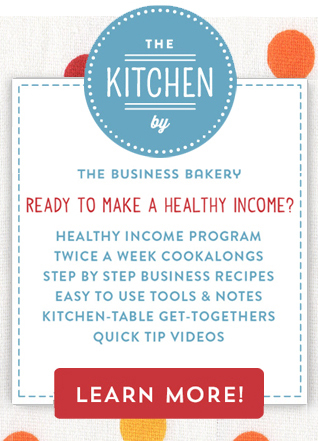 Over the past two years over 40,000 people have done the 100 Day Goal with The Business Bakery. We’ve all learned heaps so I’ve turned the learnings into a little process to make it work super-well for you! ‘Process‘ sounds so boring doesn’t it? But it does work, so here it is! I know this sounds a bit obvious, but setting the right goal is super-important. And the right goal needn’t be anything fancy – it just needs to be something you REALLY want to achieve! Really! For lots of reasons we don’t always set goals that are actually meaningful to US! Often we set goals to please other people or because we feel our real goals aren’t lofty enough. Anyhoo, you don’t need to do any of that here. This is all about a goal YOU want to achieve. Now sometimes it’s not as easy to work out what you REALLY want to achieve as it sounds! So give yourself a bit of time to think about it. Better to get it right than to rush into it! 1. Make sure your goal is measurable – you want to be able to track how you are progressing and know whether you’ve achieved it! 2. Don’t set your goal too high! Being ambitious is good, but it’s also got to be within the realms of possibility! 3. If you’re short on inspiration, sales figures make good 100 day business-y goals! Actions are tasks that work directly towards achieving your goal. So if your goal is to sell 10 dresses, actions are the tasks that actually result in the sale of those 10 dresses! The best actions are those things that you aren’t ordinarily doing (or aren’t doing very often!) after all if you’re going to achieve something you haven’t already achieved, you need to do things you’ve not already done. Yes?! Unfortunately most of us are a bit hopeless at actually taking Action! 1 We confuse Action with Motion. Action is the stuff we do that directly works towards achieving our goal (eg going to the market to sell the dresses). Motion is the stuff that just keeps us busy (like making lots of dresses but not actually taking the Action to sell them!) We tend to do lots of motion thinking that it’s Action! 2 We don’t know what Actions to take. If the goal is to sell 500 dresses, we might not know what Actions to take to actually sell that number of dresses! Or maybe we are too busy to think about it properly! 3 Taking Action is uncomfortable. The other problemo is that taking Action is hard. It’s often exactly the stuff we don’t like doing. Yes?! Don’t edit them! Write down anything! Be wild! Be creative! Ta-da! You’ve got a Master Action List! Once you’ve got your list keep it for Step 4! At the start of each week (maybe on a Sunday night?!) look through your Master Action list and pick the Actions that you are going to do this week. Now, I know some of the things on your Master Action list are a bit out there, and not pickable as an Action you can really do. But, y’know what? 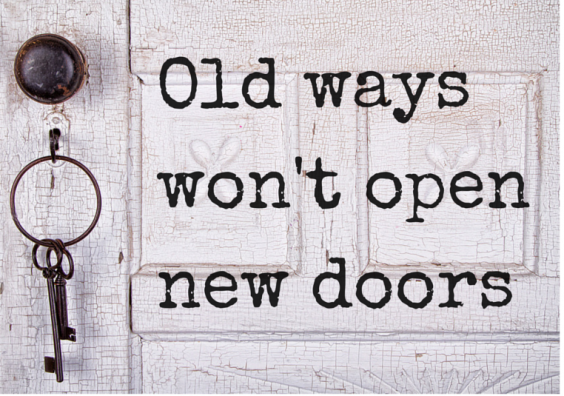 Those whacky ideas will help you come up with things you CAN actually do! Funny but true! Your Weekly Action List shouldn’t take too long to do. I do it on a Friday afternoon and it’s quite a nice way to finish the week! Deciding the Actions you are going to do tomorrow, tonight, is totally the BEST way to make sure you do Action- stuff every day. And it’s is super- easy because you’ve actually done the hard work already! Hurrah! Just pick one or two things off your Weekly Action List (Step 4) and pop them on your ToDo list for tomorrow. Turning your Actions into items on you ToDo list helps them get done! We’ve got a (free!) 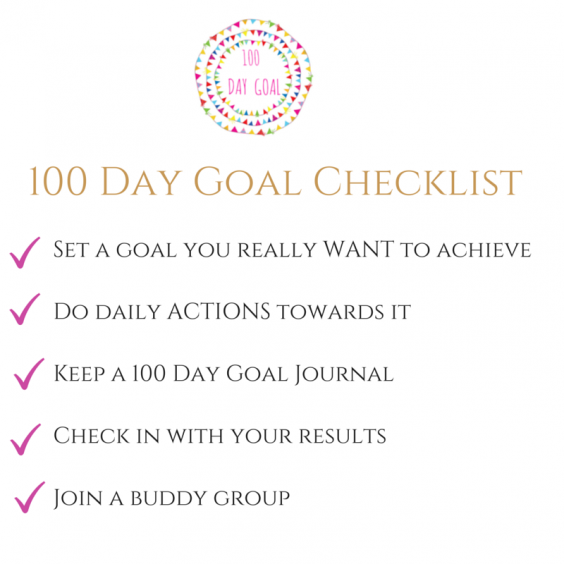 printable 100 Day Goal Daily ToDo List which you can download here. This is my 100 Day Journal. It’s from Kikki K! This is MAGIC! Really! 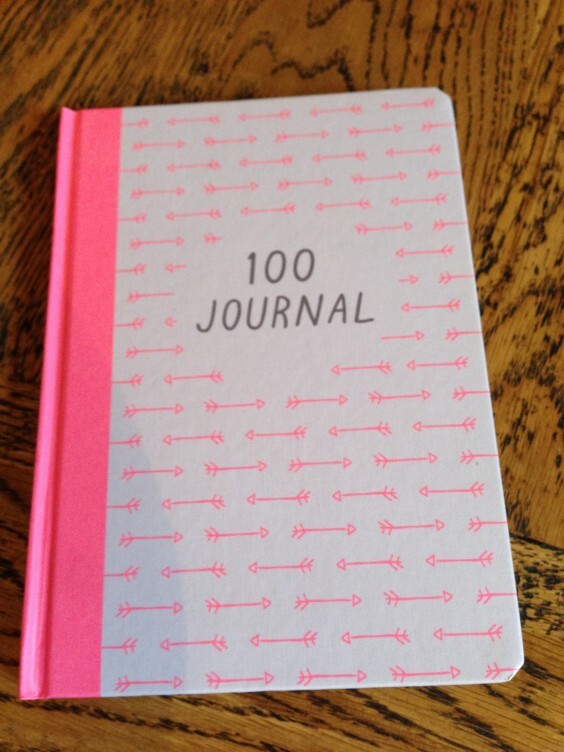 It’s the 100 Day Goal Journal and it’s the little bit of gorgeousness that brings it all together! We’ve got a free printable which you can use as a template for your 100 Day Journal here! Write your journal every day even if you haven’t got a lot to say. Kinda keeps you moving, albeit small-ly! We send a cute daily ‘write your journal’ reminder. It’s super-useful because we all forget occasionally, or lose track of what day it is. Fancy it? Just pop your details in here. 100 Days is a l-o-n-g time to stay motivated. Most of us feel pretty excited at the beginning but sheesh it’s a bit of a slog! So if you’d like to join a little buddy group to help keep you going we’ve got a super-nice Facebook group that does just THAT! You can get the details here. 1 Have fun getting ready. I find buying a nice notebook for my 100 Day Journal helps! 2 Write out your first TWO WEEKS of Actions before you start. It helps to not have to think each day! 3 Promise yourself you’ll do the 100 Day Journal for two weeks minimum. I reckon after that you’ll want to carry on! Tips to keep you going! 1.The 100 Day Journal will really help you do your daily Actions because you’ll want to have something to write in it! 2 Having your Master Action List will mean you’re never wondering what to do! 4 Pin your 100 Day Goal on your wall will keep it top of mind! What do you think of the 100 Day Goal? D’you like it? Have you tried it? Will you give it a go?! 13 Comments on "The 100 Day Goal! We’re doing it AGAIN!" Agreed, this is a great idea and I think it’s just what I need! Can’t wait to start! Im going to start this today!!!! Hi. 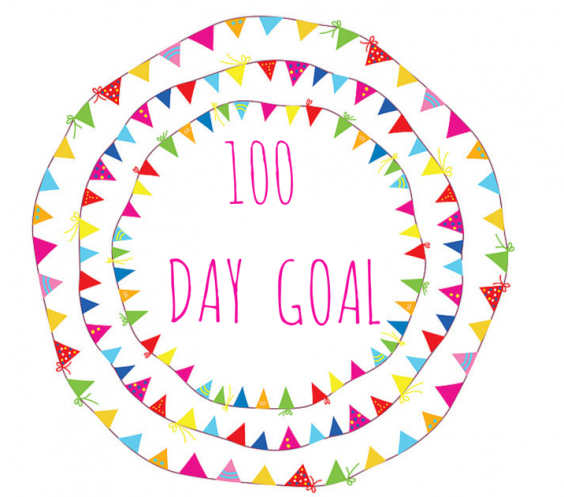 Will you be doing another 100 day goal this year? Hi Julie, I have missed my first week of the challenge as I have been on the farm. Do you have a quick catch up, so I can still get on board or shall I wait til next challenge. Although, I’d really like to do this now if I could please.